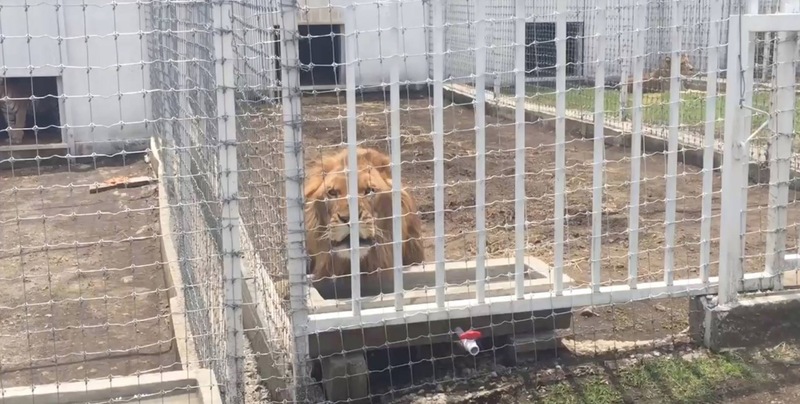 This story is being written so that a lion named Pharaoh’s death will not be in vain like so many other animals at Tiger Safari in Tuttle, Oklahoma. They died at the hands of Bill Meadows the owner of Tiger Safari. Recently, other than Pharaoh, a White Tiger named Maximus, a Golden Tabby Tiger named Sarabi, and a Lynx named Baktan all died tragically. I managed Tiger Safari last year for 7 months and was their primary caretaker. Bill refuses vet care to all his animals until the USDA steps in. This kind of negligence has been going on for years according to USDA Inspection Reports that are public record. 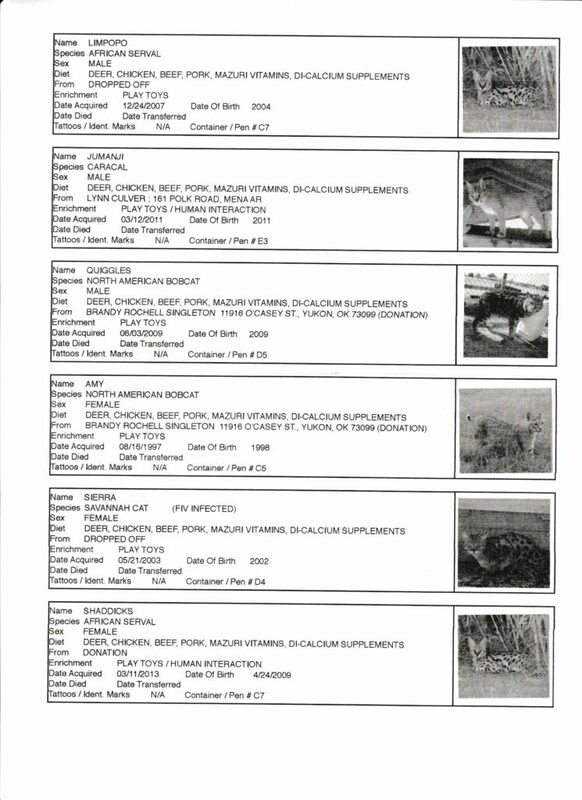 Some of the abuse that I and the USDA has seen is documented on these reports. Pharaoh died February 26th, 2016. It was another case of Bill Meadows refusing vet care, malnourishment, and neglect. Pharaoh was born in 2001 (15 years old). Lions can live in captivity for 20 years old with optimal care. Multiple customers saw the malnourished lion had a bloody nose and reported it to the owner Bill Meadows weeks before Pharaoh’s death. Bill refused him veterinary care and did not call a vet until Pharaoh was in the terrible condition seen below and could stand. Pharaoh was severely emaciated and malnourished at the time he died. He has not been sick in the past year until Bill starved and neglected him. These are pictures of Pharaoh, the one on the right is the picture taken the night before Pharaoh died. I sent it to the media, USDA, and Sheriff. After complaints I made to the USDA inspectors, Sheriff, and 2 media stations they all showed up at once to Tiger Safari to question Bill about the circumstance surrounding Pharaoh’s death. The oppositionists like Bill Meadows, Joe Schreibvogal (GW Exotic), and Tiger Safari’s vet Dr. Patti Maness say that Pharaoh was about 18 and just old and sick. This is not true. Pharaoh was 15 years old and that is shown on the Tiger Safari website at http://www.tigersafari.us/animal_view.asp?animalID=9 that says “Lifespan: 15 years in the wild, 24 years in captivity. 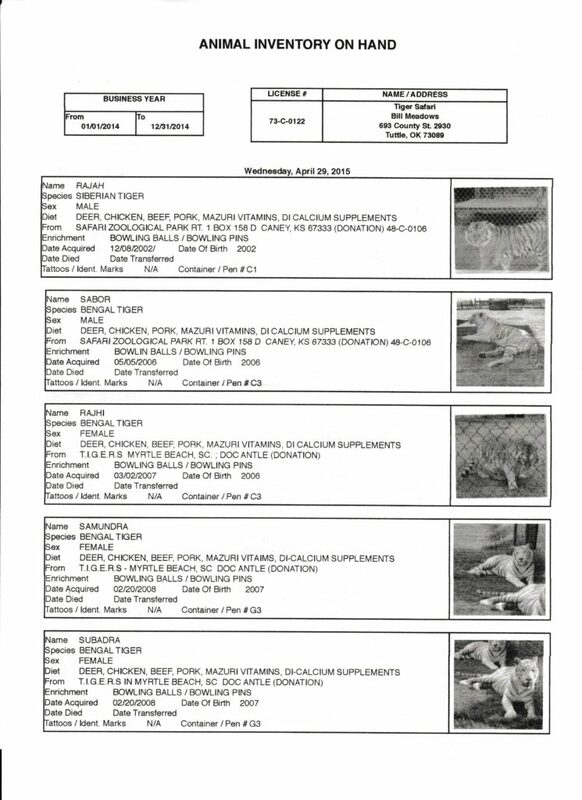 Pharaoh was born around 2001.” The USDA Inventory records for Tiger Safari has the same information about Pharaoh’s real age. If he was 15, like the Tiger Safari website and animal inventory claim, Pharaoh should still have quite a bit of life left since lions can live to be 20 years old in captivity. Bill and his vet Dr. Patti Maness are claiming Pharaoh was ridiculously old and sick which was not the case. Pharaoh didn’t get sick until Bill Meadows starved him. I use to have a ton of respect for Dr. Maness before this happened, it is very disappointing. The point here is NOT that Pharaoh was old or sick; the point is that Bill let Pharaoh get to the position where he was suffering for a long time and literally starving to death. That is negligence which the USDA does not allow and that is why I made complaints to the USDA on February 22nd, 2016 and February 25th, 2016. My motive was to get help for Pharaoh after Bill refused him vet care for a couple weeks before he finally died. According to the USDA records they hadn’t seen Pharaoh since their inspection in January and that is around the time he got sick and started losing all that weight. I think the USDA inspectors do a great job but they can’t be there all the time to see everything. Just like any other large federal agency. Sometimes the USDA does not have the resources to inspect every month and it ends up sometimes being three months before they can go to tiger Safari. Which is enough time for things like this to happen without them seeing the violation. If they don’t see it they can’t cite Bill for it and he is great at getting rid of evidence as well as infamous for lying to the USDA to cover his many indiscretions’. If Pharaoh lost that much weight in that short period of time it means he was sick. Bill should have called a vet when Pharaoh stopped eating but didn’t. He didn’t call a vet until Pharaoh was so malnourished he couldn’t stand. Then Bill finally had him looked at by a vet, Dr. Patti Maness. Dr. Maness claimed she was treating Pharaoh at some point in the past but did not disclose that it had not been since 2009 when Pharaoh healed from his massive bacterial infection. Their negligence can be proven by looking at the vet records and the necropsy, which the USDA will do. If a vet saw Pharaoh before Feb. 22nd like Dr. Maness and Bill are insinuating, there should be records. If not it just proves they were lying. The first complaint I made was on February 22nd, 2016 about how Pharaoh was refused vet care for weeks. Pharaoh wasn’t eating for a long time. When a body is in that condition, it is deprived of nutrients, the body can’t function correctly, and pain is inevitable. The necropsy report will be in soon for the USDA to look at. I could compare this situation to a house cat. If your cat looked like Pharaoh did in the picture the night before his death would you let them lay there and suffer while they slowly starved to death? It is our responsibility as pet owners to make sure that doesn’t happen, but Bill obviously doesn’t agree. Bill let Pharaoh get so emaciated that he was not able to stand up and all of his bones were sticking out of his body instead of euthanizing. Euthanasia exists so pet owners don’t prolong an animal’s pain. If Pharaoh was starving, untreatable, in pain, and as old as they claim why didn’t Bill and Dr. Patty Maness help Pharaoh before he got so emaciated? Maximus died February 3, 2016. He choked on something he wasn’t supposed to have and slowly asphyxiated until he died. Maximus was about 3-4 years old and his species usually live 16-20 years in captivity. Maximus was the cub featured in the HSUS Tiger Safari Undercover Investigation video. Sarabi died September 6th, 2015 when she was around 3-4 years old. It was another case of improper diet, refusing vet care, malnourishment, and neglect. Sarabi’s species usually live 16-20 years in captivity. 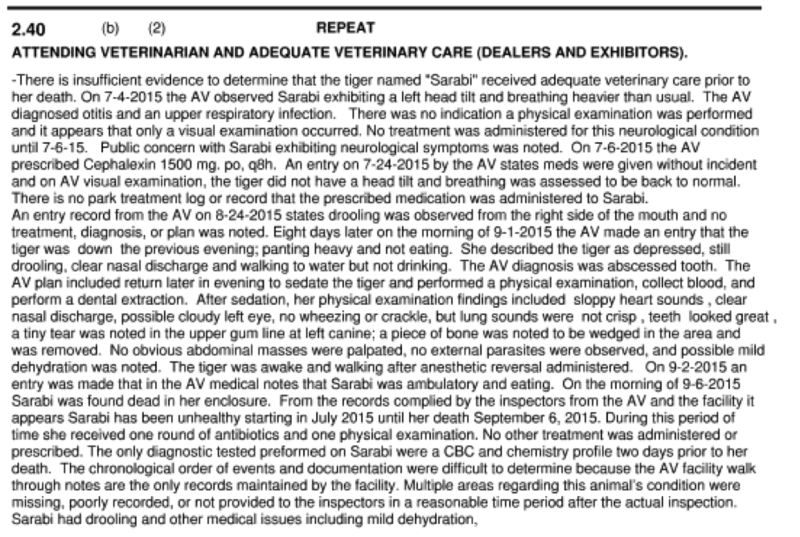 The image below is from the October 22nd, 2015 USDA Inspection Report on Sarabi’s death. 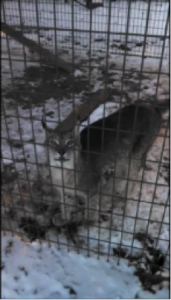 Baktan, a Lynx, was born May 14th, 2013 and died around January 1st of 2015. 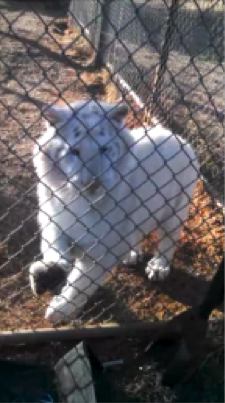 He was only about 2 years old when he died and they can live up to 21 years in captivity. I only took care of Baktan for about a month before he died. When I found him it looked like he had a seizure in the middle of the night. The necropsy said they only found some bleeding in the lining of his liver, but Dr. Maness did not check the brain where they would find the evidence of a seizure. It was yet another case of malnourishment and neglect by Bill Meadows. Baktan died so young because Bill deprived him of a proper diet during development and throughout his life. Less than a year before Baktan died, he had a brush with death because Bill once again waited too long (neglected) to call a vet for help. Baktan had begun to show signs of severe neurological symptoms including running headfirst into everything when he tried to walk and drooling. Bill waited weeks again to call a vet that time, and that is why he almost died then. The USDA is aware of this as well. Bill has been cited multiple time for the terrible diet he feeds his carnivores, especially his Big Cats. The USDA called the diet Bill fed them a type of “McDonald’s diet”. I can verify that the only meat Bill would bring me to feed the carnivores was ground beef, marinated or seasoned steak and chicken, regular chicken breasts, and fatty cutlet scraps from a meat processer in that area. Carnivores, especially tigers and lions, need a lot of calcium they get through eating bones. The meat Bill gave me to feed had almost no bones every day. This leads to malnourishment, neurological dysfunction, and severe medical issues throughout their lives and they die young. I sent the photo into the news stations but I am not affiliated with any animal rights organizations. I did it because it was the right thing to do. Humans who own caged pets have an obligation to not let them suffer like Pharaoh did. I reported the neglect as I saw it when I worked at Tiger Safari. I would beg Bill Meadows to do the right thing & get the animals vet care when they needed it before I made any USDA complaints. The USDA confirmed the neglect I saw. I wanted to get my story out so people can make an informed decision on Tiger Safari. It is their right to know who they are giving their money to and can chose not to support his abuse. Carole Baskin, the founder and CEO of Big Cat Rescue, helped me do this in an interview and webpage that can be seen on this page. 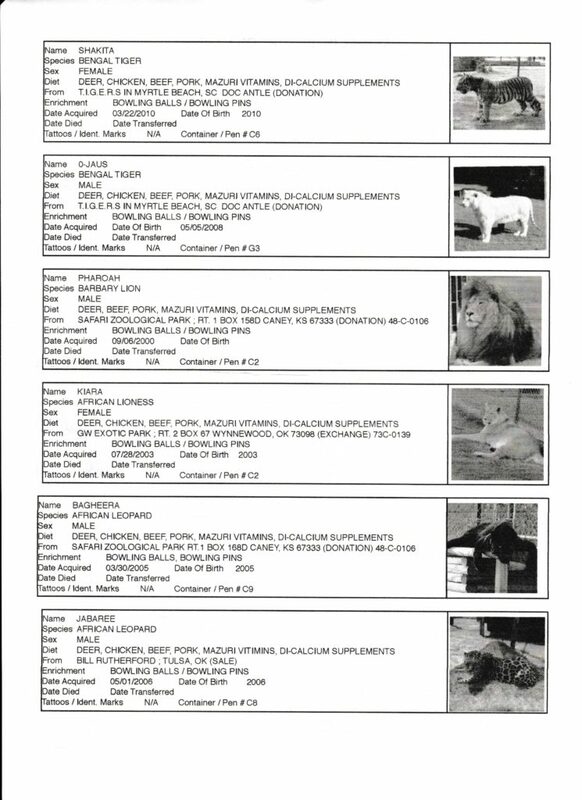 You can also find Bill Meadows inspection reports and evidence of other cases where he refused sick animals vet care on this link. More can be read at about what Maximus and Sarabi’s very unfortunate life at Tiger Safari. Feb 26, 2016 Pharoah the lion dies at Tiger Safari amid complaints from those who worked there that the cat was malnourished. News reports state that this is the third big cat to die there in the last year. 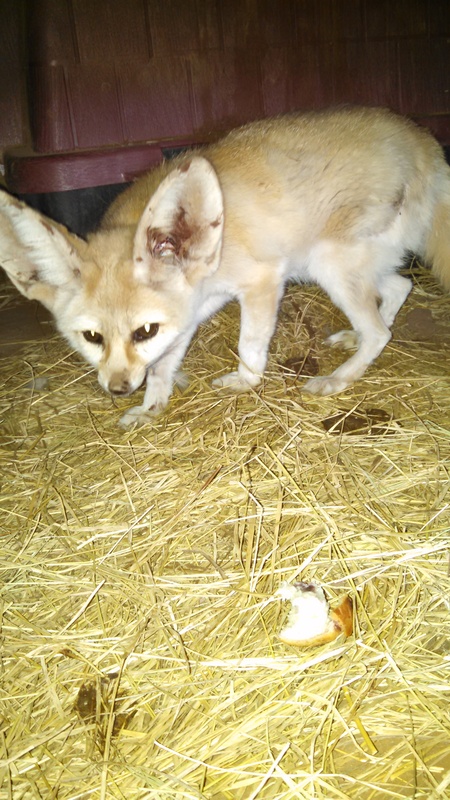 I had called our APHIS inspector to make an emergency complaint about this fennec fox and Smokey the black bear on 5-8-2015 (when Bill locked Smokey in his house for 36 hours without water after “Tigernado”). That was what I was fired for. Our APHIS inspector came out that day and wrote Bill up and I was told by Bill that it was sent to the regional office. The fennec fox was in the USDA-APHIS Inspection Report 5-8-2015. I took pictures and recorded him when I asked him a couple of times to at least go check on the fennec fox to get her vet help and he refused. Smokey had a penile infection and his nails were growing into his pad during the 5-8-2015 inspection. 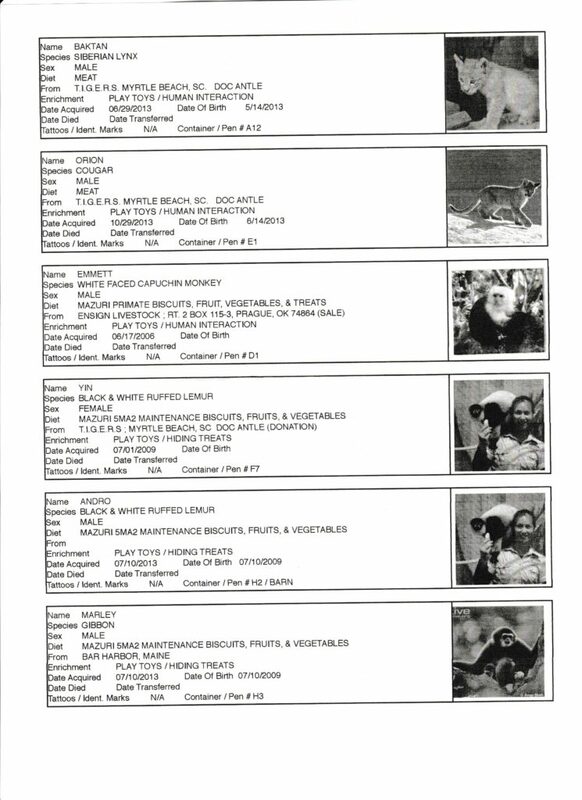 At the same time APHIS called Bill to say they were coming on 5-8-2015, Joe Schreibvogel, from GW Zoo was on his way to pick Smokey up for temporary housing and had to cancel. Bill Meadows told Joe Schreibvogel not to come because APHIS was on their way to Tiger Safari at the same time to look at Smokey. Joe was coming to get the bear since a pavilion fell on the front portion of his cage the night of “Tigernado”. The damage is also why Smokey was locked in his house without water for 36 hours. I tried to get him a hose to drink from but he wouldn’t. Joe was only holding Smokey until it was fixed. It was kind of funny because at the same time, I think, Joe and Bill actually got Smokey to GW Zoo, OSHA was there investigating a complaint about their bear enclosures being unsafe. Joe picked Smokey up I believe on May 10th, 2015, and he got back June 3rd, 2015. 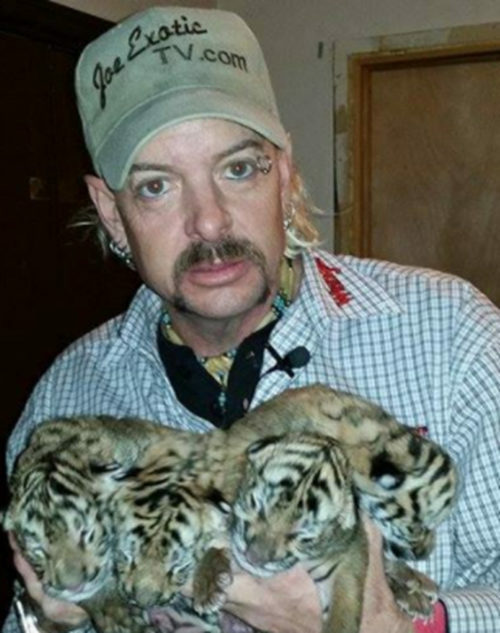 Get more info about Bill Meadows of Tiger Safari, Inc. here. TUTTLE, Okla. – In an undercover investigation into Tuttle’s Tiger Safari, the Humane Society of the United States (HSUS) alleges mishandling, even abuse, of tiger cubs. Behind-the-scenes footage is raising serious questions about the treatment of these exotic animals. The owner of Tiger Safari, Bill Meadows, says he is not abusing his animals and says the HSUS is using the allegations as propaganda. 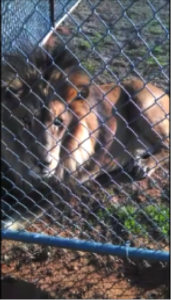 He tells us the video is edited to misrepresent his zoo. However, the HSUS says their investigation took place from May to September of 2014 and they documented exactly what they witnessed. The HSUS says the 63-day investigation was centered on a white tiger cub named Maximus. A HSUS employee worked at the park as an intern to capture undercover footage. The organization claims the cub was taken from his mother too soon after birth and forced to spend hours a day being handled by or photographed with dozens of people. When Maximus was not cooperating, HSUS claims the cub was smacked, dragged and sometimes suspended by his legs and tail. “This really was to document, like I said, never before footage of really what happens behind the scenes of these places. What we found was horrific. We knew it was bad, but we had no idea about how bad it actually was,” Nicole Paquette, with HSUS, said. Meadows told us on the phone that the popping in the nose is to train the cubs not to bite. As for video of him dragging the cub on a leash, Meadows says he did not mean to drag the cub and stopped when he realized what he was doing. We know the United States Department of Agriculture conducts regular inspections at Tiger Safari. HSUS says they caught Meadows saying this to his employees. Meadows tells us he did not want new workers to give out misinformation. HSUS also claims animals at Tiger Safari do not receive proper care and nutrition, but Meadows invites anyone to visit the zoo. He says visitors will see that the animals are well-cared for.